When I think about the compliments I've been given in my life that really stuck with me, they were usually unique, original, and weren't something like, "Whoa, nice eyes, girrrrrrl." Usually, when given one of these stellar compliments, I ended up feeling a boost to my ego, and a spring in my step. Saying these types of things to others is a great way to boost another's day. Bonus: When you lift others' spirits, it often leaves your spirits a little higher, as well. 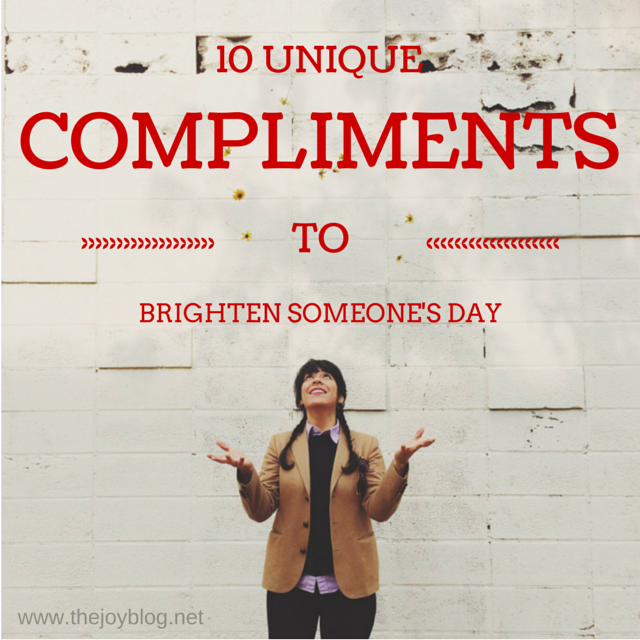 Here's a short list of compliments that you could pass out like candy, and brighten someone else's day. 1. Your laugh is contagious! 2. A person can't help but feel awesome around you, so thanks for sharing the awesomeness. 3. Hey, you really handled that well. I was impressed. 4. If personalities could be gained by taking doses of them like vitamins, I'd stock up on every bottle of yours. 5. You are the kind of person who is able to accomplish anything you put your mind to. 6. You seem like a genuinely happy person. 7. Your courage is so refreshing. 8. I need advice on something, and you're the first person I thought to ask. 9. When I'm around you, I feel like I can just be myself. 10. I'm pretty sure I'll never find another person like you in this world, and that is my favorite thing about you. ++ What are your favorite unique compliments? And for you: it's inspiring to see people unabashedly sharing and spreading joy online. You're totally fabulous for being a part of that. So... I checked out your blog. I'm in love! Your stories are so happy and upbeat. And obviously, that's kind of my jam at the moment. THanks for reading. I'll be adding you to my bloglovin feed! Wow. Any and all of those compliments are fantastic! I know this sounds so lame...but I kinda like shoes. A lot. And, when I met my now husband, the first compliment he gave me was that he liked my shoes. I'll always remember that because it wasn't the typical male "come on". I always appreciated a man who could notice when I had my best shoes on.